You all know the story, right? 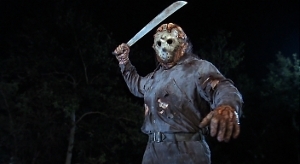 Friday the 13th Part VIII was both the most expensive and least profitable film of the franchise. Gee, I wonder if those two facts are connected somehow? Even if they aren’t, Paramount spent the late-80s and early-90s “restructuring” itself after a string of flops (like Friday the 13th Part VIII) drove newly hired managers to do what managers love to anyway and sell everything that wasn’t nailed down. Including Jason Voorhees.